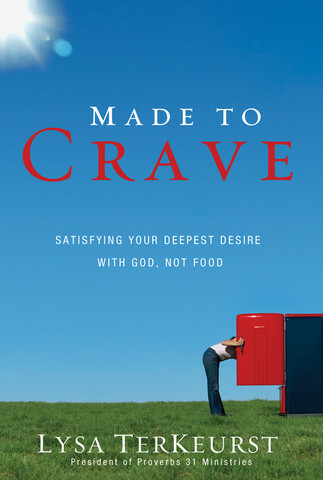 In my last post I had mentioned that I will be taking part in the online Bible Study for the book, Made To Crave, with Proverbs 31 Ministries. I was very excited to find out they are doing this study. See, of all temptations in life, food is probably my biggest weakness. I LOVE food! But not in a sense of what it should be, nourishment to my body, fuel to be active and healthy. Oh I know that is the case, but I also have an incredible love for junk food, especially sweet things like desserts! I’ve never met a donut I could pass by, or a piece of cake. And ice cream? Well you know that statement, “opportunity knocks, but temptation leans on the doorbell”? That kind of temptation doesn’t bother with the doorbell, it has a master pass key through the front door! I know I am a comfort eater, and emotional eater. I eat for every emotion. When bummed, I eat. When happy, I eat. What good things happy, why let’s celebrate and eat! I did a really decent job of keeping myself at a good weight until my divorce began 4 years ago. While short in process, after it was final I stopped caring about what I was eating and put on about 30 pounds over the past 3.5 years. For several years prior to my divorce, my then husband and I were walking so far off the path. We had been members in good standing at church, taught children’s ministries and were youth leaders for the junior/senior high. Then we fell, and hard. Together we walked through the pits of sin and when we divorced I continued to live in the pig sty of life before finally finding my way back. It has not been easy, this prodigal daughter is rather bull headed, pride and ego got in my way numerous times before I finally shook off the mess of the past and crawled back on to the path toward my Savior again. This study is not only for my physical well being, to get food back into it’s proper perspective, but more than that, to keep Christ in His proper place in my life. What a blessing to find this study starting up. My son’s mother-in-law has done this study and said it was good, so I bought both the book and devotional for my Kindle, and I cannot wait for it to get started. Are you struggling with food? Sin? Or maybe just need to re-ground? Join us! There are over 33,000 signed up for this online study, what a fantastic support network that will be! 33,000+ believers all studying God’s word together, what an amazing blessing! Just go to Proverbs 31 Ministries Current Study page and get signed up! The book is less expensive if you have a Kindle, or the Kindle reading app on your computer. The study launches on January 19th, hope you will be a part of this too! I look forward to going on this journey with you! That is something I struggle to remember – food is fuel – too. And walking far off path? I. Get. That. I’m praying that God draws you in close and reminds you how good it feels to walk with Him again. Keep Christ where He should be… not food. Excellent post! Thank you for sharing!